2009 ISAF Match Racing World Champion Adam Minoprio and his team stepping up to claim the Argo Group Gold Cup last week, has caused the World Match Racing Tour (WMRT) leaderboard to be closest it has ever been going into the final event of the annual championship, the Monsoon Cup. While it is no great shock that topping the leaderboard is five time ISAF Match Racing World Champion Ian Williams and his GAC Pindar crew, after last week’s showdown on Bermuda’s Hamilton Harbour when the British skipper was knocked out in the Quarter Finals, finishing in lowly seventh place, two teams are now nipping at his heels. Meanwhile Swedish skipper Bjorn Hansen and his Nautiska Racing team finished third, while Taylor Canfield’s US One team - a past winner of the Argo Group Gold Cup, and making a late charge in the World Match Racing Tour this year - also did well, coming home fourth, losing the Petit Final to Hansen. So going into the Monsoon Cup teams get to count their top three results of the season so far. However while other results can be discarded in the overall annual championship scoring, their Monsoon Cup result cannot. This, combined with points scored at the event being weighted with a 1.5x co-efficient, means that inevitably there is a tense conclusion to the season’s final event. But this time the Monsoon Cup will be properly the World Match Racing Tour ‘Season Finale,’ given the Argo Group Gold Cup leaderboard shake-up which has left Williams leading Hansen by two points and with Canfield a further three points astern. “Basically in Bermuda it was all down to the Semi-Finals - whoever made it into the final between Hansen and Canfield would have ended up leading into the Monsoon Cup. But they both got knocked out,” observes WMRT Tour Director, Craig Mitchell. As a result there are just five points between the current podium placers going into the Monsoon Cup. But the question is who? To give an indication of how close it is, if the Monsoon Cup final ended up with Williams facing Taylor Canfield and Canfield won, this would leave both skippers on 137 points with the US Virgin Islander winning on count back. 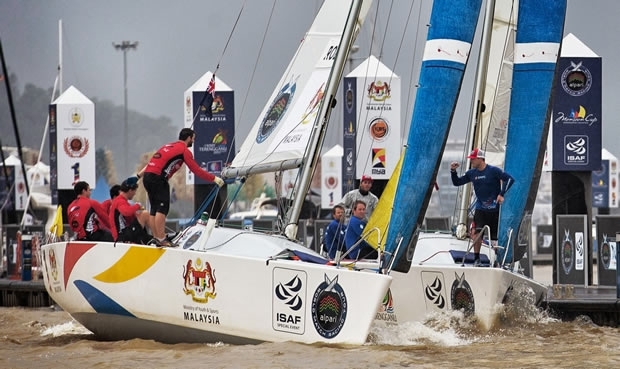 While the likelihood is that one of these three teams will be claiming the ISAF-sanctioned ‘World Champion’ title as a result of winning the 2015 World Match Racing Tour, other teams remain in with a shot of a podium place. Both Australian Keith Swinton and his Black Swan Racing Team and New Zealander Phil Robertson and his WAKA Racing Team performed exceedingly well at the Argo Group Gold Cup. Having only scored points in two World Match Racing Tour events this season prior to the event, for both skippers Bermuda was a mandatory counter wherever they finished. Fortunately for Swinton, he ended up second after losing the Final to Minoprio and this result was enough to elevate him up to fourth place overall on the leaderboard, 10 points adrift of the podium. Similarly Robertson came home fifth, but having scored better results than Swinton earlier in the season he now trails the Australian by just two points. It is very possible that either Swinton or Robertson could win Monsoon Cup at the same time as one of the present top three could fall early on in the Monsoon Cup, thereby probably getting them on to the podium.